Blade: High quality chrome-vanadium-molybdenum steel, through hardened, chrome-plated. Colour-coded Wiha ChromTop® tips. 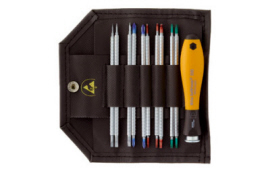 Handle: SYSTEM 4 SoftFinish®-telescopic ESD Handle. ESD-safe (dissipative), surface resistance 10^6 - 10^9 Ohm. Enables adjustable blade lengths from 18-90 mm. Click-stop ball clamp guarantees a secure hold and rapid blade exchange. Extra: In roll-up pouch made of black artificial leather, extra tough. With 4 mm hex retainer for all SYSTEM 4 blades. 105 x 23 mm diam.